Workshops and projects are in full swing! Special thanks to visiting instructors, Morgan Van Madison, Louise Krampien & Erika Tada. These images were taken at Bullseye Resource Center Portland over the past few weeks. Thanks for an inspiring workshop, Morgan! 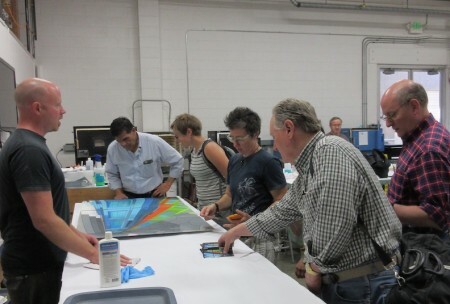 Artist Lynn Basa (center) visits Bullseye's Research & Education studio to check in on the project. 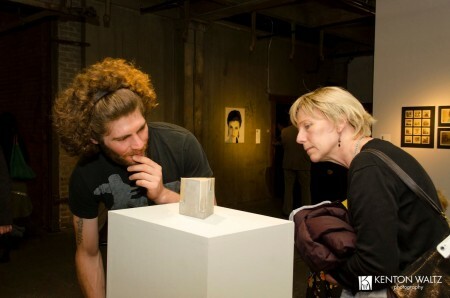 When I first saw online images of the glass that had been selected for the Emerge 2014 show, I was puzzled. I couldn’t understand what distinguished these pieces from many of the other images of glass I had looked at online, or why they would be chosen to represent the forefront of emerging contemporary kiln-glass. Then I attended the Emerge 2014 opening at Bullseye Gallery, and realized what I had been missing—and why. We’ve got plenty of Ponderosa Pine in the Pacific Northwest. It grows in Central Oregon and arrives at Bullseye in truckloads to be made into crating for the sheet glass we make. I’m still digesting the lessons learned on Navy Pier. When it’s gelled into something more coherent than I’m capable of today, I’ll put a post together. In the meantime, the latest news: our SOFA return shipment arrived at the gallery in Portland on Friday. By end-of-day Saturday the tireless gallery team had packed, wrapped, and strapped the Miami pallets that are now waiting for a Monday pick-up. This is it with the silly games. I promise. But I can’t resist just one last round. It’s bound to stump even Sarah and Jenn. I’m back home in Portland, Oregon after five weeks bouncing around Britain, juggling everything from an art fair in London to lamb watching in the Scottish Highlands. Smack in the middle of it all I got to watch an amazing residency that over eight short days knitted together thirteen artists, two old buildings, and one tiny village – with a glass thread that I expect to hold strong for years to come. Day before the residency begins: Steve, Karlyn & Richard experience the slippery slope outside Harbour House. It all started with two remarkable artist/teachers, Steve Klein and Richard Parrish and the idea to explore “Kiln-glass in the Built Environment” in a private residency at North Lands Creative Glass. They called the project “IN PLACE” and over the space of many months selected eleven participants from around the world.